With the launch of our social media sites in Fall 2017, CTE hopes that faculty will become active members on our private Facebook and LinkedIn Groups. The cool thing about LinkedIn Groups is that, even if you are not very active on social media, you can subscribe to receive a weekly or daily e-mail composed of group updates. If you want to stay in the loop, but do not use social media frequently, LinkedIn Groups is the place for you via the e-mail subscription option! Log into your LinkedIn Account. (Or set one up today! Most faculty use their university e-mail). 3. You can then request membership by clicking the blue Ask to join button under the group description. 4. 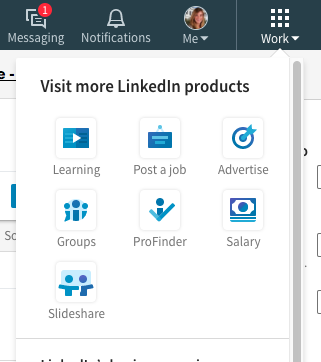 Click the Work icon in the top right of your LinkedIn homepage and select Groups. 5. Click on My Groups. 6. Click on the settings icon next to the CTE Faculty Group and click Group Settings. If technology is not your forte, but you still want to get set up on LinkedIn Group E-mail Subscriptions send me an e-mail at m.t.webb@iup.edu, and I can come to your office and help you out personally, or we can walk through the steps via a phone conversation.